This is Noodler’s review 3 of 3 for this week. I never even planned to try this ink, but that all changed when I received a letter written with it. Now, I’m sure it had something to do with the letter writer’s amazing handwriting, but I really fell for this shade. See, I like blues, but I love them even more if there is a hint of green to them. 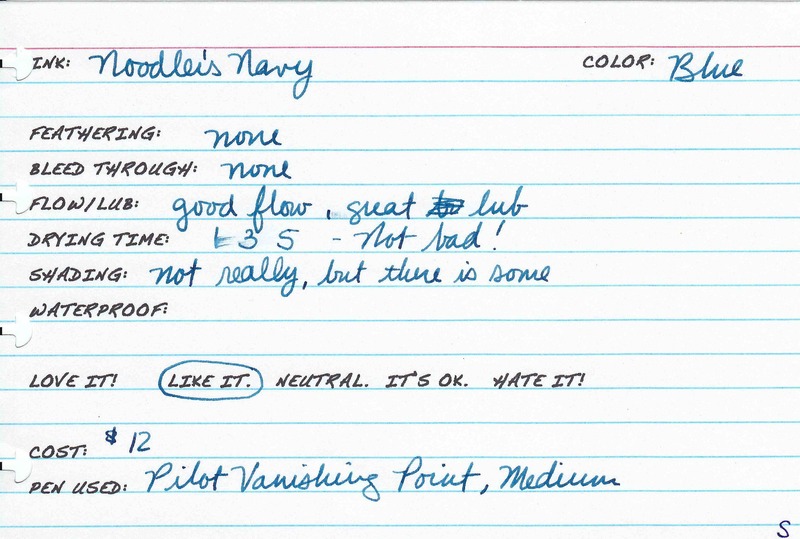 Noodler’s Navy is just that: Navy. It is a dark blue with a touch of green. It is very well behaved. I’ve had it in a Pilot Petit 1 for at least 3 weeks straight, and it is still going strong. I carry that little Petit 1 with me everywhere. I use it to sign receipts, jot down quick notes, or anything else that requires a pen. This ink performs admirably even on less than stellar paper. No feathering or bleed through. Even in poor quality papers. Good flow and even better lubrication. Fast drying at under 5 seconds. There is a little shading depending on the nib, paper, etc. This ink is not waterproof, but it is VERY water resistance. The blue rinses away, but a blackish line remains. It is very easily legible. I use it in a Pilot Custom 823 with a juicy broad nib. Still pretty unassuming to me. It is, after all, navy. Great shading though!